CHICAGO, Illinois, December 2, 2010 (ENS) – A binational coalition of over 70 mayors from Quebec, Ontario and the eight Great Lake States fear that the proposed maritime shipment of 16 giant radioactive steam generators from Ontario’s Bruce Power to Sweden for recycling could release radioactivity into the water in the event of an accident during shipment. The generators, each the size of school bus and weighing 100 metric tonnes, would be shipped from Owen Sound, through Georgian Bay, across three of the lakes, up the St. Lawrence Seaway and across the Atlantic Ocean to Sweden. Organized as the Great Lakes and St. Lawrence Cities Initiative, the mayors have expressed concern over the potential environmental impacts to the Great Lakes and St. Lawrence if a shipping accident occurs. The Great Lakes and St. Lawrence form the largest body of fresh water in the world. Over 20 million Canadians and Americans live close to the shoreline of this vast basin, and over 40 million people rely on them for safe drinking water. Bruce Power says the company is trying to reduce its environmental footprint by recycling the 16 steam generators removed from its Bruce A facility instead of placing them into long term storage. The generator recycling effort is part of work now underway to restart Units 1 and 2 of Bruce A nuclear generating station, and the obsolete generators are now held at Western Waste Management Facility. The Bruce site is located 250 kilometers (155 miles) northwest of Toronto, Ontario on the shores of Lake Huron between the towns of Kincardine and Saugeen Shores. 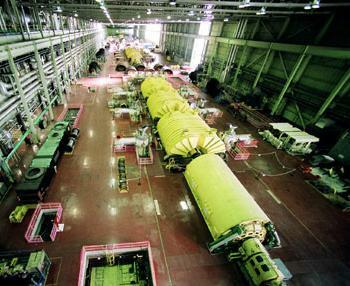 Canada’s first private nuclear generator, Bruce Power is owned by a group that includes two corporations, the Cameco Corporation and the TransCanada Corporation, as well as the Power Workers’ Union, the Society of Energy Professionals, and BPC Generation Infrastructure Trust, a trust established by the Ontario Municipal Employees Retirement System. Bruce Power argues that transportation of the steam generators will be performed by qualified companies with proven experience in moving heavy components, and says the generators are considered low level radioactive waste and are well within regulatory limits to ship. “The only difference between this shipment and the thousands of other shipments made each year is the size of these components,” Bruce Power says. 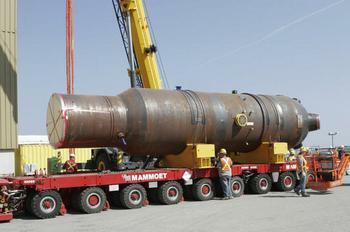 Because they do not fit into the containers traditionally used for shipping low level radioactive material, Bruce Power requires a special license from the Canadian Nuclear Safety Commission. “The level of contamination is very low and confined to the inner parts of the generators,” the commission says on its website. “No licence will be issued unless the CNSC is convinced that the shipment will be completed safely, without risk to the health, safety or security of Canadians or the environment,” the commission says. But the mayors of the Cities Initiative are concerned about the formal review process now taking place under the Canadian Nuclear Safety Commission, including “information gaps” about the proposed shipment. Following public hearings in late September, the commission requested a supplemental report from its staff to address information gaps that were brought to its attention by the Cities Initiative and others. In its analysis of the supplemental report, the Cities Initiative found that an accidental spill of radioactive material during its shipment in the Great Lakes nearshore area or in Owen Sound harbor could exceed federal standards for radioactivity in drinking water that could trigger emergency intervention. The Cities Initiative remains “seriously concerned with the flawed environmental review conducted by the proponent, Bruce Power, and the CNSC staff,” the mayors said in a statement November 23. “Safety scenarios do not consider more serious accidents, rely on a series of assumptions, and lack an assessment of ecological risk,” the mayors warned. “The CSNS revised staff report confirms many of our concerns,” said George Heartwell, mayor of Grand Rapids, Michigan, and past chair of the Cities Initiative. In addition, the mayors are concerned about the potentially precedent-setting nature of the shipment. They warn that the amount of radioactive waste to be shipped exceeds by 50 times the international allowable limit for a single shipment in inland waters. The commission says the public is encouraged to address any questions or concerns to the CNSC by email at info@cnsc-ccsn.gc.ca, or by phone at 1-800-668-5284.